SEARCHLIGHT, Nev. (AP) — Sarah Palin told thousands of tea party activists assembled in the dusty Nevada desert Saturday that Sen. Harry Reid will have to explain his votes when he comes back to his hometown to campaign. The wind whipped U.S. flags behind the former Alaska governor as she stood on a makeshift stage, holding a microphone and her notes and speaking to a cheering crowd. She told them Reid, fighting for re-election, is "gambling away our future." At least 9,000 people streamed into tiny Searchlight, a former mining town 60 miles south of Las Vegas, bringing American flags, "Don't Tread on Me" signs and outspoken anger toward Reid, President Barack Obama, the health care overhaul and other Democrats who supported it. Palin told them the big-government, big-debt spending spree of the Senate majority leader, Obama and House Speaker Nancy Pelosi is over. A string of polls has shown Reid is vulnerable in politically moderate Nevada after pushing Obama's agenda in Congress. His standing has also been hurt by Nevada's double-digit unemployment and record foreclosure and bankruptcy rates. The Searchlight native responded with sarcasm to the large crowd gathered in the hardscrabble town of about 1,000 he grew up in. "I'm happy so many people came to see my hometown of Searchlight and spend their out-of-state money, especially in these tough economic times," Reid said Saturday in a statement released through his Senate campaign. "This election will be decided by Nevadans, not people from other states who parachuted in for one day to have a tea party." Traffic on a highway leading into the town was backed up more than two miles Saturday afternoon as people gathered for the rally, which kicks off a 42-city bus tour that ends in Washington on April 15, tax day. It's been called a conservative Woodstock, and takes place just days after the historic health care vote that ushered in near-universal medical coverage and divided Congress and the nation. The vote was followed by reports of threats and vandalism aimed at some Washington lawmakers, mostly Democrats who supported the new law. The day before the vote there were hundreds of furious protesters on Capitol Hill, many of them tea party activists, and some black lawmakers said they heard racial epithets coming from the demonstration. It's not known who made the remarks described by the lawmakers. Speaking at the rally, conservative columnist Andrew Breitbart disputed any suggestion that tea party activists in Washington were involved, although he didn't provide any evidence. "I know you're not a racist group," he told the crowd. Las Vegas Metropolitan Police Department sent officers to patrol the crowd, but aside from a report of fistfight that officers didn't see, the event was orderly and there were no arrests. One person was detained and released after police received a call that someone was carrying a gun in a holster, the department said. Palin, the 2008 Republican vice presidential nominee, appeared after spending Friday and Saturday morning campaigning for Sen. John McCain, the Arizona Republican who led the 2008 ticket. Now a Fox News analyst and potential 2012 presidential candidate, Palin faced criticism after posting a map on her Facebook page that had circles and cross hairs over 20 Democratic districts. She also sent a tweet saying, "Don't Retreat, Instead - RELOAD!" She said Saturday she wasn't inciting violence, just trying to inspire people to get involved. "We're not going to sit down and shut up. 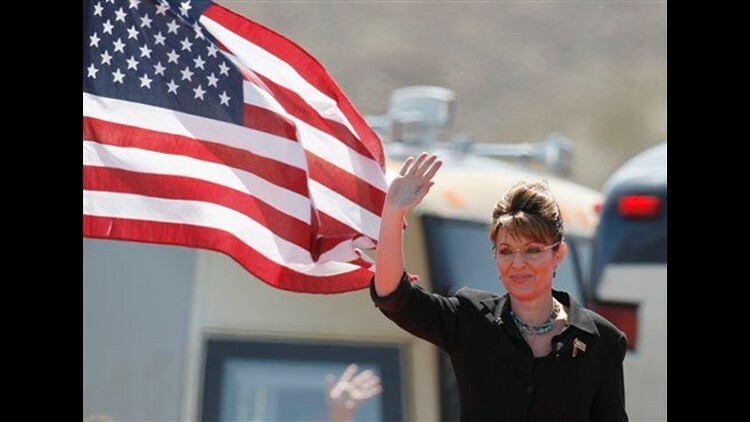 Thank you for standing up," Palin said. The tea party movement is a far-flung coalition of conservative groups angered by Washington spending, rising taxes and the growth and reach of government. It takes its name from the Boston Tea Party in 1773, when colonists dumped tea off English ships to protest what they considered unfair taxation by the British crown. "Some of you are registered Republicans. Some of you are ... what we used to call Reagan Democrats," Palin said. "And some of you are like so many of my friends and my family, including my own husband, just independent, not registered in any party. The rally was a festival of all things conservative, as well as a political call-to-arms. Protesters dressed as Colonial soldiers with three-corner hats and marched through the crowd beating drums. There were Ronald Reagan masks, plenty of camouflage, and American flags fashioned into every manner of dress. Placards danced in the wind: "Stop the Obama Nation"; "Change It Back"; "No Taxation Without Representation." Donna and Jim McGeachy, both 63 and Republicans, held a "Don't Tread on Me Flag," and said the government has stopped listening. "We are talking to you, but you turned a deaf ear," Donna McGeachy said. "We're kind of what you call the silent majority," her husband said. "I think it's about time to change." Organizers had said up to 10,000 people might come; around 1 p.m., police estimated the crowd was between 9,000 and 11,000. Leonard Grimes, a 70-year-old retired logger, said the nation is drifting toward socialism, and he's not convinced Obama is eligible to be president. "I'd like him to prove he's an American citizen," said Grimes, a registered independent who is originally from Michigan but now lives in Golden Valley, Ariz. He called the health care bill "a joke, just another way to enslave the American public." Reid supporters set up a hospitality tent Saturday in the parking lot of a Searchlight casino, about a mile from the tea party rally. The Senate leader planned to spend part of the day at a new shooting range in Las Vegas with National Rifle Association Executive Vice President Wayne LaPierre. Luis Salvador, 55, an unemployed fire sprinkler fitter, drove down from Las Vegas to support Reid, who he said has done a lot for the state and doesn't deserve the protest brought to his hometown. Another Reid supporter, Judy Hill, 62, said she doesn't understand the hatred of Reid. The longtime Democrat from Searchlight said she thinks people just don't know the man she calls a friend. "They listen to the rhetoric. I think he's very misunderstood and under-appreciated," she said.